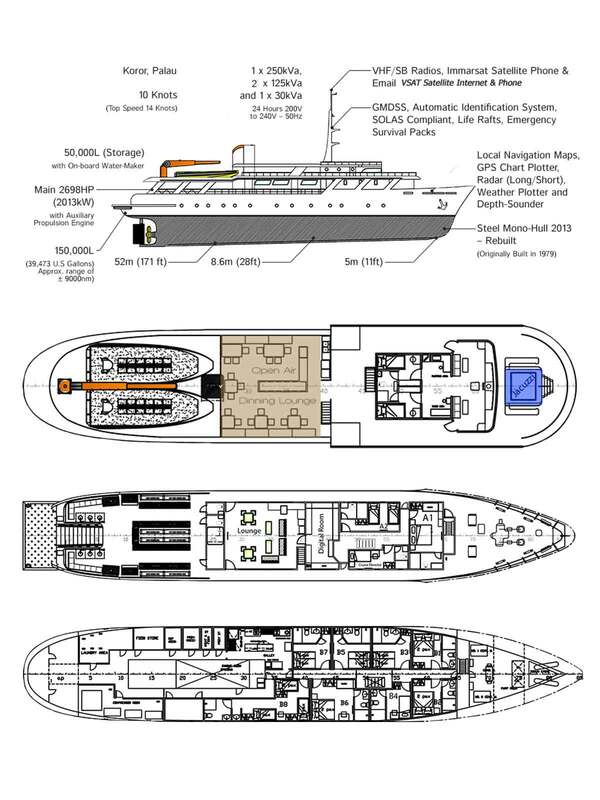 More a ship than a liveaboard dive boat, the Solitude One Palau liveaboard is 52 meters (171ft) in length with an 8.6 meter (28ft) beam with four decks. She was built in 1979 but underwent a complete and extreme overhaul in 2013 turning here into the luxury liveaboard dive boat she is today. She offers 10 comfortable fully furnished cabins with air-conditioning, en-suite bathrooms with hot and cold water, and in-room entertainment systems. She takes a maximum of 22 guests on board. The MV Solitude One liveaboard Palau has 10 guest cabins including two staterooms with king beds and a day bed, seven deluxe cabins with either double beds, twin beds or bunk beds, and one family style quad cabin with twin beds and bunk beds. The stateroom day bed can be converted for a child under 12 years of age. She has a total of 12 bathrooms on board complete with hot and cold showers. Like most Palau liveaboards, the MV Solitude One uses skiffs to whisk you to the dive sites while the mothership stays at anchor or moves to another site. Solitude One Palau liveaboard has two two-engine 37ft skiffs which cruise at 27 knots, plus a support skiff. All tanks and heavy gear are handled by staff. The dive guide ratio is no more than 6:1. You’re allowed up to four dives per day. Solitude One operates in Palau and the Philippines. Most of her trips are eight days in length though she is able to stay at sea for weeks at a time and offers some special crossings trips for up to 20 days. She is available for individual bookings as well as charter cruises. Individual prices are listed below in the schedules. Please contact us for charter prices. All Palau departures are from Koror, Palau, serviced by Roman Tmetuchi International Airport (ROR). Transfers are provided from your hotel or the airport to the Solitude One.